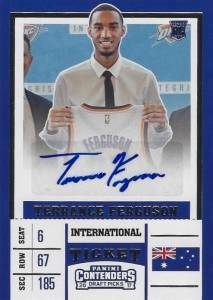 While the college offshoot has been around for a few seasons, 2017-18 Panini Contenders Draft Picks Basketball tweaks a few things and also brings with it some hard-signed autographs. 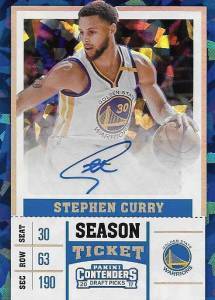 Changing the hobby format from the 2016-17 set that had five autographs and 24 packs per box, the 2017-18 edition increases to six autographs, but drops the total to six packs with 18 cards in each. A main part of the Contenders set is based around Tickets for both the veterans and rookie players. 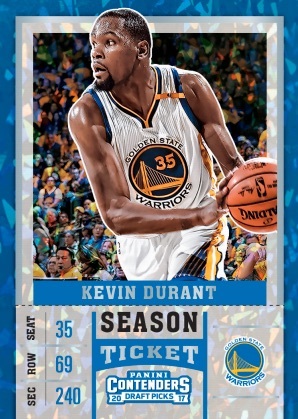 Season Ticket is the standard base offering with 50 cards for past and present NBA players. 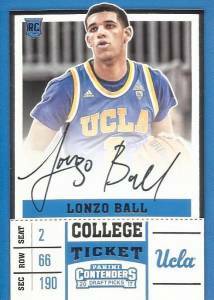 Adding to that, signed versions include International Ticket, College Ticket and RPS College Ticket cards, which showcase on-card autographs for names like Lonzo Ball. These hard-signed RPS cards also have a trio of image variations per player. 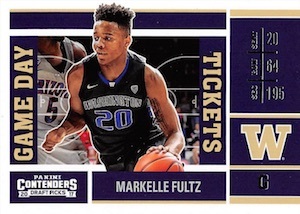 Keeping to tradition, the 2017-18 Panini Contenders Draft Picks Basketball tickets are treated to parallels like Draft Ticket (#/99), Cracked Ice Ticket (#/23), Diamond Ticket (#/15 - new), Building Block Ticket (#/10 - new), Fame Ticket (#/5 - new), Championship Ticket (1/1), and Printing Plates (1/1). Each of these numbered editions is noted as being exclusive to the hobby format. Of course, the tickets are not the only game in town. The Turning Pro Signatures set utilizes a then-and-now format with a college image and pro image for the same player. 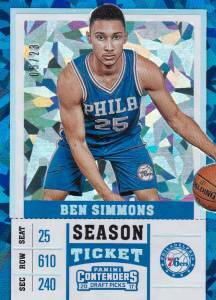 Similarly, Legacy Signature cards specifically highlight college stars that later played in the NBA. Tying together two subjects, College Connections Signatures is a dual-autograph option. 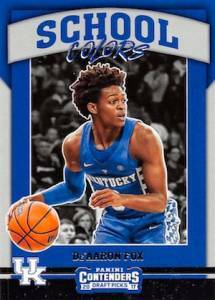 Shop current 2017-18 Contenders Draft Basketball cards on eBay. TICKET PARALLELS: Draft #/99, Cracked Ice #/23, Diamond #/15, Building Blocks #/10, Fame #/5, Championship 1/1, Printing Plates 1/1. VARIATION TICKET PARALLELS: Variation, Draft Variation #/99, Cracked Ice Variation #/23, Diamond Variation #/15, Building Blocks Variation #/10, Fame Variation #/5, Championship Variation 1/1, Printing Plates Variation 1/1. BASE TICKET PARALLELS: Draft Blue Foil, Draft Red Foil, Draft #/99, Cracked Ice #/23, Playoff #/15, Championship 1/1, Printing Plates 1/1. *VARIATION TICKET PARALLELS*: College Ticket Variation, Draft Blue Foil Variation, Draft Red Foil Variation, Draft Variation #/25, Cracked Ice Variation #/23, Playoff Variation #/15, Championship Variation 1/1, Printing Plates Variation 1/1. 54 cards. Shop on eBay. TICKET PARALLELS: Draft Blue Foil, Draft Red Foil, Draft #/99, Cracked Ice #/23, Playoff #/15, Championship 1/1, Printing Plates 1/1. TICKET PARALLELS: Draft Blue Foil Variation, Draft Red Foil Variation, Draft Variation #/99, Cracked Ice Variation #/23, Playoff Variation #/15, Championship Variation 1/1, Printing Plates Variation 1/1. TICKET PARALLELS: Draft Blue Foil, Draft Red Foil, Draft #/99* or 1/1, Cracked Ice #/23, Playoff #/15* or 1/1, Championship 1/1, Printing Plates 1/1. Don’t like this at all. I don’t collect the NCAA, and won’t as long as they continue to treat their basketball and football players essentially as slaves. But I do collect the NBA. I don’t want them mixed in the same set. I will pick up the cheapest real (NBA) card I can find just so I have it represented in my collection, but I will not be spending any significant amount of money on this set. Just got in on a case break of this and besides a Fultz cracked ice there wasnt much in it besides a bunch of second round picks and tons of duplicate autos. One box had 3 autos of one guy and 3 autos of another, both were nobodies. I know these are going for a high price right out the gate cuz of all the big names but to me its just not worth it unless you pull one. Product looks great. Variations look nice. Only wish Panini took better care of these cards as most aren’t worth attempting to grade due to poor corners. same guy in a box, I quit. and I am a biggggg basketball collector. Rally strong product this year, the on card autos and new limited editions are pretty special. LSC sold out so I bought three blasters. Autos were all players who were not drafted and only their mothers would know who they are. Bummer! And you can tell the variations how? but which is the variation? 2017-18 Panini CONTENDERS DRAFT PICKS Basketball HOBBY BOX Sealed New w 6 AUTO. 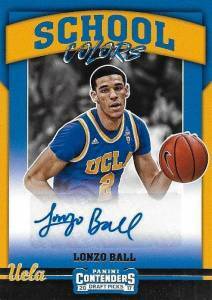 2017-18 panini contenders basketball Hobby Box. Brand New Sealed!